ST. PETERSBURG — A steel beam recovered from the World Trade Center will become the centerpiece of a 9/11 memorial sculpture and park in the Warehouse Arts District. The steel beam was given to the owners of American Freedom Distillery, Scott Neil, a retired Special Forces veteran, and Mark Nutsch, who was the commander of a team of Green Berets that fought the Taliban while mounted on horseback. Their distillery is in the Warehouse Arts District. 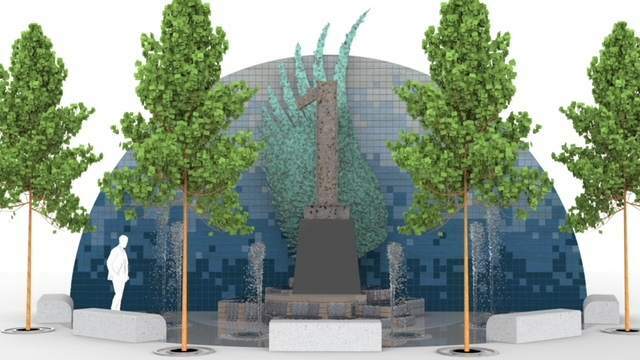 Rise St. Pete, a 20-by-40-foot monument designed by Mark Aeling of MGA Sculpture Studio in St. Petersburg, will include an interactive fountain and a dramatic wing made from copper recovered during the recent renovation of the Statue of Liberty. Encompassing the memorial will be a blue tile arch made at the Morean Center for Clay and four trees, symbolic of the Callery Pear Tree that survived the World Trade Center attacks and became known as “The Survivor Tree.” Aeling wanted to create a monument that pays tribute to the past while providing a sense of hope for the future. The groundbreaking will take place at 10 a.m., Nov. 10, at Fifth Avenue S and 22nd Street.